Your shoulder joints (also called your glenohumeral joints) are the most mobile joints in your body. They are ball and socket joints, but the sockets are not deep enough to hold the balls securely. Because of this your upper arm bone can move partially or completely out of the socket. If it moves partially out it is called subluxation (sub-lux-ay-shun), but if it moves completely out it is called dislocation. 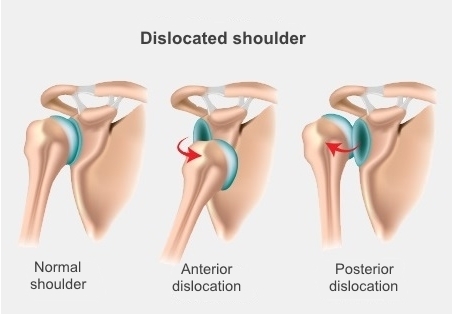 Your shoulder joints can dislocate forwards (called anterior dislocation) or backwards (called posterior dislocation). Anterior dislocation is by far the most common of the two. Anterior dislocation doesn't happen much in children but is common in 18- to 25-year-olds, often resulting from sports injuries. It is also quite common in older people, who may have less stable shoulder joints because their muscle is wasting, and who are more likely to fall. If you have an unstable shoulder you can do some exercises at home that will help. They include towel squeeze, shoulder shrugs, and resisting rotation, inwards and outwards. How is anterior dislocation of the shoulder treated? You may need to have your arm in a sling for one to two weeks – your GP or physiotherapist will let you know how long you need to wear it for. While you have the sling, you should wear it all the time – including at night – and underneath your clothes for at least the first few days. After that, when you're not wearing the sling, take care for two weeks to avoid lifting your arm in the way that dislocated it. Take extra care when showering, bathing or dressing. If you are over 60, your doctor will want to check your shoulder after one week, as you are more likely to damage muscles around your shoulder and might need early physiotherapy. When can I start using my shoulder more? It can be very painful when your shoulder dislocates. Your muscles may be damaged, making another shoulder injury more likely. It might also feel like your shoulder is going to pop out of its socket in certain positions. Once you start healing, it's important to gradually increase how much you use your shoulder, so you can build up your strength and mobility. So once your doctor says it's OK you should gradually start moving your shoulder more. You should also see a physiotherapist who can help you get full movement and strength back and get you back to what you were doing before your accident. You may have to pay for this – if paying is difficult for you, ask your GP if there are any other options. It will take 12 to 16 weeks for your shoulder joint to fully heal. During that time, you should avoid any throwing movement if your shoulder dislocated forwards, or avoid exercises like press-ups, burpees, or planks if your shoulder dislocated backward. Also avoid any contact sports and activities that could put stress on your shoulder, until your doctor or physiotherapist says it's OK. Written by a Canterbury physiotherapist. Endorsed by HealthInfo clinical advisers. Last reviewed September 2017. Orthopaedic Outpatients Department, Christchurch Hospital. Anterior dislocation of shoulder – patient information. 1 October 2008. Authorised By: clinical director/director of nursing. Ref: 0081.